Bosh, James and Wade in Miami together? I dont think so. We are two days away from the day that every Cleveland Cavalier, New York Knick, Chicago Bulls, Dallas Mavericks and New Jersey Nets fan has been waiting for. But if you are a fan of any of those teams, you are probably not happy with the reports that are coming out about Lebron James and Chris Bosh going to Miami to team up with Dwayne Wade. That is a positive sign for Cleveland, New York, Chicago, Dallas and New Jersey. Personally, I don’t see Lebron signing with the Heat at all. There is no way that lebron would play on a team with Dwayne Wade who is already a top five player in the league and has a reputation for being able to carry a team on his back to win a championship. If Lebron and Bosh went to Miami and the Heat won championships. Lebron wouldn’t be looked at as the one who brought Miami to the promise land. Either Wade would get credit, or people would consider it as a group effort amongst Wade, Bosh and James. People already question Lebron’s ability to make plays in big games like Kobe and Wade routinely does, and his ability to take a team to the promise land. 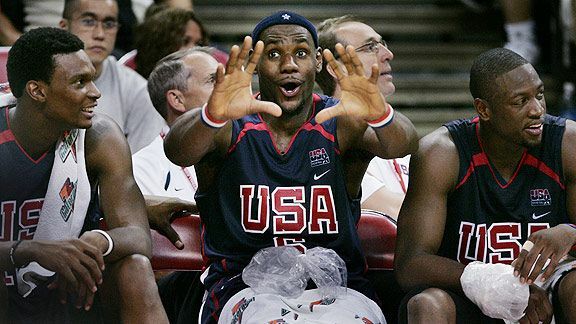 How much of a hit will Lebron’s on the court image take if he teams up with Wade and Bosh? How is Nike and every other company going to market and sell Lebron to the world as being “the man” if he goes to Miami playing in Wade’s shadow? Some would say that Dwayne would have the same issue as Lebron if this NBA marriage happens. But I would have to disagree with that idea about Wade. Dwayne has already built his reputation as a clutch player and has a ring. He can play with other superstars now and no one will question him nor will his on the court image take a hit. The NBA, who is an individual star driven league, will have a hard time marketing Lebron as “the man” down in Miami. People view the Miami Heat as Wade’s team. The NBA relies on having top level superstars who battle against each other every night to create marquee matchups. Not along with each other. Not only do Nike and every other company need Lebron to be “the man”, but so do David Stern and the NBA. I don’t believe in conspiracy theories unless it’s the JFK assassination, but I wouldn’t be surprised if David Stern’s wallet got involved somewhere during this Lebron free agency signing period. Bottom line folks, don’t get caught up in the soap opera mess that’s going on right now. Lebron’s decision is a little more complicated than what some people realize. Yeah he wants big money via a NBA contract and wants to win, but he also needs to continue to build and maintain Lebron Inc. I think that the big problem that is going to face these top tier free agents is the ability to find a good supporting cast because teams have shed so much salary in order to get them. Is A-Rod’s career incomplete b/c he only won his ring with the Yankees? I think that Lebron is attracted to Miami because of D-Wade and because he’s a young guy — and, well, because it’s Miami. I agree, Miami is a great city and alluring to damn near anyone. Hell, I even own a place in Miami and I dont live their fulltime, lol. But I think from a business perpsective, its not a good move for Lebron unless he doesnt care and all he wants is a ring. Which most guys in his position at his age want it all plus more. When it comes down to it, I believe it’s about egos and dollar signs. I agree with you because I don’t see Lebron as willing to be Wade’s shadow or even share the spotlight with him. Plus I think it’s almost impossible for any team to clear up enough cap space to add two 2010 free agents and still be a playoff contender. Good blog. I don’t believe Lebron will be in Wade’s shadow in Miami. There will be a separate question when all is said and done like there was for Kobe once Shaq left, but when they’re playing together I can imagine Wade deferring the Alpha-dog status to King James. Wade & Lebron are friends off the court, and I think that’s what makes this scenario far more plausible. Wade really does want Lebron to play with him b/c he knows it gives him the best chance at winning many more championships. With Bosh already locked in (as is being reported now in Miami) I think it will be very hard for Lebron to refuse the invitation.